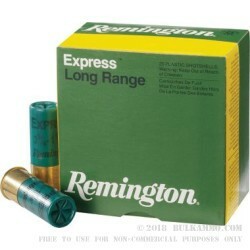 The Remington Express line of shotgun ammunition offers shotshells renowned for versatility, and these 410 bore 2-1/2 inch shotshells—containing ½ ounce of #4 shot—are no exception. These shotshells are perfect for a variety of game birds such as ducks and turkeys. They are also perfect for dispatching vermin and small predators. Crafted from lead, the shot in these cartridges travels further in a tighter pattern, allowing for successful shots at long ranges. Whether you are an expert marksman looking for a challenge or a young gunner learning to hunt, a 410 bore shotgun will suit your needs; and these shotshells are an excellent choice for a variety of applications. Founded in 1816, Remington is the largest producer of shotguns and rifles in the United States, and they are the only U.S. company to domestically produce ammunition and firearms. With a wide variety of guns and ammunition—and with over a century of producing high quality firearms—Remington is the perfect choice for all of your ammunition needs. You can’t go wrong with Remington.